High quality polycotton sheet set designed specifically for the hospital bed. Contains 1 each: contour fitted sheet, flat sheet and pillow case. Washable, white. 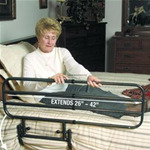 The Invacare® Care Guard Half Length Side Rail is constructed of durable chrome-plated, welded-steel, features tool-free assembly, and can be used on all spring-fabric medical-style beds.